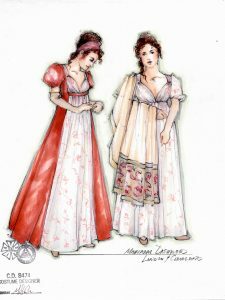 Several costume sketches by Moria Sine Clinton for the Guthrie Theater’s production of Sense and Sensibility. Tonight is the last preview for Sense and Sensibility, an adaptation of the classic Jane Austen novel opening tomorrow at the Guthrie Theater. Theatrical costuming is an important aspect of any period piece, with different garments and their cut affecting how characters stand, move, and even interact with the world. They are also create some of audience members’ first impressions, creating a window into the world they inhabit – decorations may change and sets may be abstracted, but what a character wears as a personal and social decision says volumes. The Twin Cities Arts Reader caught up with Sense and Sensibility‘s costume designer Moria Sine Clinton to talk about her work and career. This is your first time designing a show for the Guthrie, but you’ve worked with the director (Sarah Rasmussen) many times over the years. How did the two of you first end up collaborating and how did you get recruited for this particular show? We met up later on at the farmer’s market when we were both living in Brooklyn and talked about doing In The Next Room at The Jungle. We have done about a dozen projects together in the last 7 years. She was first asked to do Sense and Sensibility at Dallas Theatre Center in 2015, where we collaborated on it there. Sense and Sensibility is set in the Regency period. Is this a period that you’ve worked extensively in before? Jane Greenwood (my professor at Yale) had us do a project on Pride and Prejudice years ago that I still remember and still have folders of research from. I later assisted her on an opera [version] of Wuthering Heights (1830s) at Minnesota Opera. 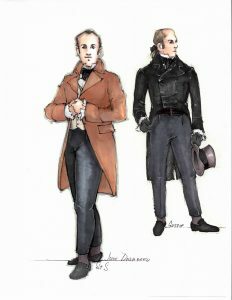 I [also] designed an opera [production] of La Finta Giardiniera at Juilliard that we set in the late 1700s/late Georgian period shortly after that. 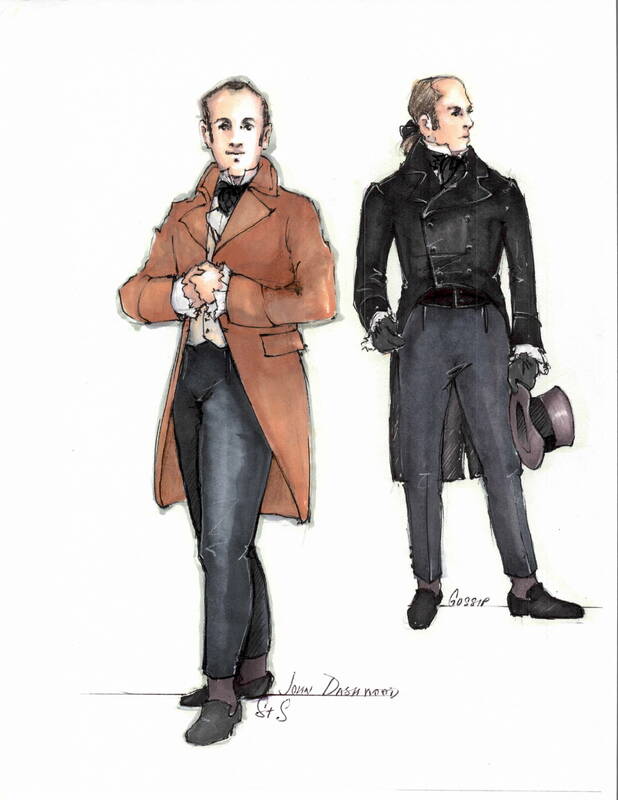 I wouldn’t say I’ve extensively worked in this period, but having worked on now two productions of this, and a production of Red Velvet last summer set in the 1830s…it does feel like I’ve definitely looked closely on how the silhouette and fashion over these 40 years subtly shifts. I can see the amazing thread that ties each year to the next and is so drastically influenced by the political and social climate of the time. 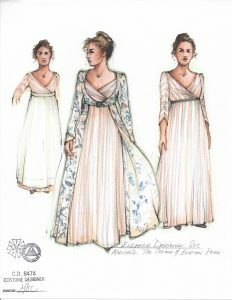 One of Moria Sine Clinton’s costume sketches for Eleanor Dashwood. 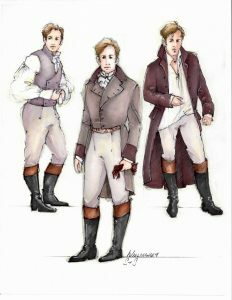 The pages of Sense and Sensibility have, flannel waistcoats aside, relatively little said about what the characters wear. What was your research and design process like for this show? To what extent have the costumes evolved since the first sketches? Kate Hamill’s adaptation has a great convention of this group of gossips; it really helps move the action and exposition along. That was really my first step into the design process for me: thinking about them being a sort of “fly on the wall”, with their commentary feeling very outside and looking in, with no real stakes in the violence their opinions provoke. Adjacent to that image were men’s and women’s clothes in a pallet of stark white, black, and brilliant golds. I knew that was my base for these circular characters whose lives swarm around our two sisters [Elinor and Marianne Dashwood]. Regency paintings are epidemic in this pallet, which was a great inspiration. It let me have a foundation to set what I think of as the heart of the play, these 2 sisters and their inner circle. I tried hard for Elinor and Marianne to always be dressed as the lightest figures on stage, to center your focus that it’s their story. The family and love interests each have a bit of their own signature pallet of soft plums and celadon green that paint a picture well with each other. A costume sketch of Marianne Dashwood by Moria Sine Clinton. I swatched fabrics for the show between drawing and painting so it felt really tangible and as close to the final garments as they could. But I also think of the sketches as just one of the many tools in the process. Your resume includes several set design credits – is this an avenue that you are currently exploring as well, or more of an exceptional thing? The first thing I think about when reading a play is the space. I would love to design more scenery. I studied both [set and costume design] in undergrad and grad school. I assisted a number of British designers at the Santa Fe Opera who did both – it just happens less frequently in the western canon. It’s also much harder to break into set design as a woman. Only about 20% of sets are designed by women, where in contrast about 70% of costume designers are women. It’s the only artistic position women dominate in theatre. When you add it up less than 25% of artistic positions are held by women, including writing, directing, and design. Read Porsche McGovern’s Howlround article on designers’ gender ratios in the American theatre. Moria Sine Clinton’s sketch of John Willoughby, Marianne Dashwood’s dashing but not entirely principled suitor. Also when you get known for doing one thing, you can easily get pigeon-holed as one or another. Tell me about one of the more unusual costumes that you’ve created over the years. I would say Anne Steele was a struggle for me, just because her character is so tacky-it was hard to design such tacky clothes. One of Moria Sine Clinton’s costume sketches for John Dashwood, a kind but easily manipulated man whose inheritance sets Sense and Sensibility in motion. I see that your website has designs that you created for the Opera America Director-Designer Competition last year. How common is it for you to create speculative designs like this? How did the process differ from designing with a specific venue and cast in mind? It had been about 7 years since I had done what we call a “paper project” or an “unrealized design”. The team I worked with, spearheaded by Mary Birnbaum, is a group I’ve worked with before. It’s hard to break into opera as a younger designer (younger, meaning under 40 or 50, and we have a pretty diverse team in the world of opera), so it was an opportunity for us to have fun and work on something together again. When you don’t have specific constraints it can be a bit liberating. What’s up next for you as a designer? My flight literally just landed back in Brooklyn after I headed home after 2nd preview at the Guthrie. I head up to Vermont in a day for fittings for Macbeth. 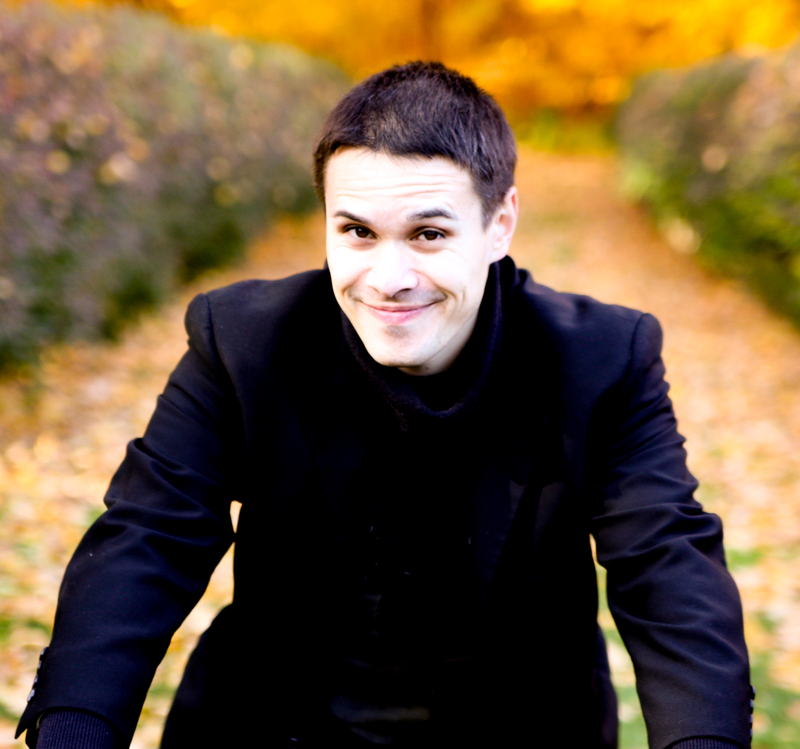 After that I have a few projects in the works in New York and hope to pick up more work in Tv or film. Sarah and I are toying with me designing sets and costume on something at the Jungle [Theater] for the holidays for 2017, so coming back to Minneapolis is also in the future. Sense and Sensibility opens in Minneapolis on Friday, September 15 at the Guthrie Theater’s Wurtele Thrust Stage, and plays through October 29.